Something to really treasure forever! Sons hold a special place in a parent's heart. Give him this personalized son gift that shows him how much you love him and watch him leap for joy. With this stunning gift for a Mom and Dad to give to her Son to celebrate a Birthday, Wedding, Graduation or Christmas, you can't go wrong. Laser engraved Pocket watch gift idea features the words "To my son, never forget that i love you. Learn from everything you can, life is filled with hard times & good times. Be the man I know you can be, Love Mom and Dad" make the perfect alternative to a regular wristwatch and with the detailed engraving, a Mom and Dad will be able to send son a thoughtful and clever gift. 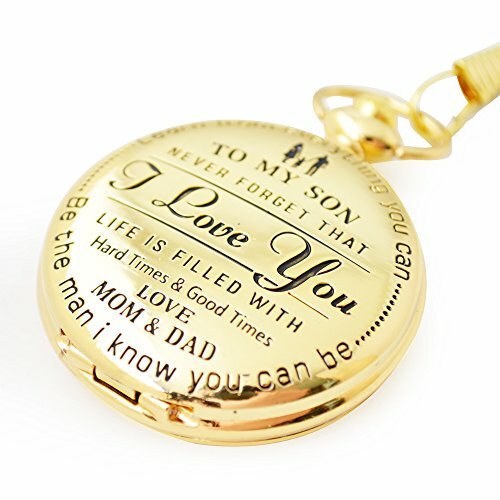 A monumental engraved words pocket watch loving gift with highly-polished zinc alloy gold metallic surface. Perfectly sized for most pockets, each gents watch measures 4.7cm in diameter. Our boys watch come with a pocket watch chain that measures 38cm in length. A fashionable alternative to a regular wrist watch, our fob pocket watches for boys and men sit comfortably in the pocket and are easily secured and accessed with the quality chain attachment. LASER ENGRAVED- Pocket watch gift idea features the words "To my son, never forget that i love you. Learn from everything you can, life is filled with hard time & good times. Be the man I know you can be, Love Mom and Dad"
GIFT - a stunning gift for a Mother and Father to give to Son to celebrate a Wedding, Graduation or Christmas. The best present for sons - Makes a great birthday gift, valentines day gift, fathers day gift. If style is important to your son, then he needs this pocket watch. Add to cart now and surprise your son with this modern twist on an old-fashioned style watch. If you have any questions about this product by Keswon Gifts, contact us by completing and submitting the form below. If you are looking for a specif part number, please include it with your message.